You’d be surprised, but Los Cabos does have it all. The perfect “home away from home”. Everything from bright blue sea to beautiful sandy beaches to perfect sunsets over desert views. Relaxing in a quiet and romantic spot can be easily mixed up with outdoor adventures and exploring the vast sea life. Whether going with friends or family, there is something for everyone. 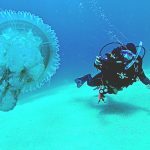 In Windermere Los Cabos we are happy to share our favorite activities in this unique destination. Just take a pick. The recognizable natural rock formation known as El Arco is a signature landscape associated with Los Cabos. Due to being the southernmost point of Baja California Peninsula, it’s also known as The Land’s End. 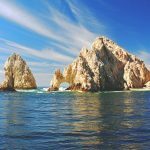 Since there is no access to El Arco by land, the best way to see it up close and get some unforgettable views and photos is by getting a water taxi. Who knows, you might even see some sea lions that love to hang out by the rocks. The beauty of Los Cabos can be enjoyed not only through the day but also at night time. 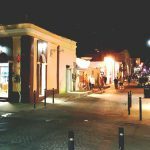 Every Thursday night between 5 PM and 9 PM (October to June) a vibrant and colorful event takes place in San José del Cabo Gallery District known as the Art Walk. Numerous galleries open their doors and put up special events for anyone wanting to see the artful side of Los Cabos. Take a stroll down the cobblestone streets, sip a glass of wine, while diving into the creative atmosphere unlike anywhere else. Take a deep breath and dive into the water. Seeing the stunning beaches of Los Cabos is one thing, but there’s more under the surface. Just a short boat ride from the marina, and you can reach some fantastic diving locations offering spectacular underwater views. There’s something for everyone. Beginners can get comfortable with diving around Lover’s Beach while Sand Falls are perfect for experienced underwater adventurers. Into adrenaline? Go off-road. 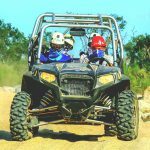 Polaris RZR tours in Los Cabos will take you through dunes and deserts, villages and beaches showcasing everything that Los Cabos climate has to offer. Grab the 4×4, a couple of friends or family and put the pedal to the metal. You don’t have to fly to the Arabian Desert to ride through the sand on the back of a camel. 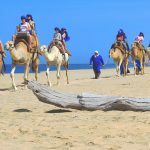 Camel riding safari in the Baja desert is perfect for everyone in the family. You can even enjoy a delicious Mexican lunch and tequila tasting as part of it. Between Cabo San Lucas and San José del Cabo lies the Santa Maria Bay. A horseshoe-shaped beach with clear turquoise water and beautiful warm sun above your head. The bay is surrounded by rocks which makes it perfect for snorkeling as fish like to hide in underwater cliffs and coral. The Santa Maria Beach is easily accessible both by car or public transport. 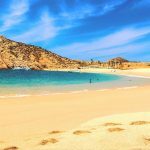 Medano Beach is not only among the most popular beaches in Los Cabos, but it’s also somewhere you can practice snorkeling. Since this is a swimmer-friendly beach with not a lot of underwater cliffs and corals, you might not see the most significant amount of fish there. However, if you plan to spend a day on the beach, why not bring those snorkeling masks and swim fins along? If you plan to visit Los Cabos during summer and autumn, make sure to give surfing a go in Costa Azul. Located on the so-called tourist corridor between Cabo San Lucas and San José del Cabo it’s suited for beginners and those already comfortable with this watersport. Complete newbies will be greeted by friendly and knowledgeable staff, who will show all the tips and tricks for mastering the waves. Whales are not the only sea animals you can encounter in Los Cabos, but they are the most spectacular. 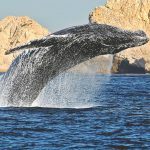 Whale watching in Los Cabos runs from 15 December to 15 April. During this time you can expect to see humpback whales and grey whales, among others. You can opt for anything from small group tours to private ones for just your friends and family, but keep in mind that you’re only allowed to approach the wales on certified boats. Another exciting option for the whole family on a day out is outdoor ziplining. 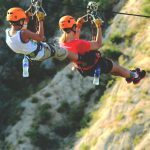 Glide over canyons or enjoy the fastest and longest zip line in Mexico going at 60 mph for over 4000 feet. If you’re looking to take your ziplining experience to the next level, why not try ziplining at night?